This model has been discontinued by the manufacturer. The 5 Port FireRepeater-800 Pro FireWire 800 Repeater Hub (IEEE 1394b) is a suitable replacement. 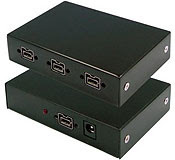 Unibrain's 4 Port Repeater Hub provides port expansion on FireWire® 800 IEEE 1394b device chains. Oriented towards industrial and machine vision applications, FireRepeater-800 PRO™ provides the ability to connect up to four FireWire 1394b devices and it's metallic compact case minimizes the risk of physical damage. The platform agnostic device provides four 9 pin (bilingual) IEEE 1394b ports with a maximum throughput of up to 800 Mbps each. The Hub utilizes IEEE 1394b bus power, or accepts an optional power adapter (sold separately) for use with devices requiring more power. Repeater hubs provide bus flexibility in that they allow for daisy chaining and/or hierarchical (tree) bus configurations. Repeater hubs also provide a means to lengthen the distance between devices when 1394's cable length of 4.5 meters (15 feet) is inadequate. Simply daisy chain repeaters between cables to extend your reach to 110m. FireRepeater-800 Pro incorporates locking 9 pin bilingual ports, multiple mounting points and an optional metal bracket to ensure an even more secure physical connection.